“Listen! Molotov is speaking. It’s war!” Everybody ran to a radio. Straight after Molotov’s speech my mother took her 9-year-old granddaughter to the nearest food shop. She bought only 200 g. of butter. I don’t know whether everything there was sold out or whether no more than 200 g. per person was allowed. I was teaching in the 13th school in the Vyborg District, where I was an assistant head teacher at that time. At the July meeting our headmaster Ivan Kobysh told us about an order to send one person from the collective to defence work. I looked as if I was 35, though I was actually 48. We all thought my wish to join the work only natural. On 12 July I had already started in the defence squad, which consisted of school teachers and high school students. We were directed to the Karelian Isthmus where we had to dig antitank ditches. We went to Rauta station by train. From there we went on foot. Our group camped in a pine forest, not far from Kexholm. We lived two to a tent and worked together with vigour. A continuous flow people went on for three days. Some of them, who were too tired to carry their stuff, simply left it on the roadside. We continued to dig. My legs became very swollen, and I had to go to an infirmary. I was released from work and was taken to the station by a passing car, and was simply shoved through a window of the last train. Our trench diggers went home on foot. Ration cards were given out in Leningrad in the second half of July. After Badayev warehouses had been burnt and the ring of the blockade tightened, our normal life changed abruptly. There were long queues in the shops. By January 1942 ration cards had been designated for particular shops. I remember an old woman walking along the queue on Bolshaya Ozerskaya Street. She was offering six silver tablespoons with a gold inlay for 200 g. of bread. When she came to me, I could only shake my head. There were four dependants in my house. I still remember her imploring eyes. When there was a holiday I was given some vodka with the help of my work ration card. I used to exchange it with air pilots for food. I remember going with my son to an aerodrome on the 6th November. Severe bombing began. There was no shelter. We hid our heads under a stone and pulled in our feet. I still don’t know how we survived. Teachers tried their best to organize normal life at school. There were lessons, work went on in the schoolyard, and the dining room was functioning. We were fed mainly with soup made with Hrjapa (a dark-green cabbage leaf, also called shrot). I couldn’t eat it even at that time. It made me vomit, although the leaves were filled with soy vegetable oil. Lessons lasted for less than three hours. There were few students. The eldest had gone to the front, and teenagers worked in the factories. Many children were evacuated with their parents. So our pupils were mainly from the 4th to the 7th grade. Orphanages were established in the city, and one was in our school. The children who came were very exhausted and infested with lice. There was a reception camp in the cellar which was a bombproof shelter. The children were put in a tub with hot water, bathed and cleaned of insects. Once I went to see our drawing teacher. He was alone in an unheated room. He lay there barely alive. I revived him with some warm tea, turned on a night light, and brought some bread bought with my ration card. But in the morning he was found dead. Whenever a house was empty, the police were informed. House doors were not locked. I once found a baby alive beside his dead mother and I brought him to an orphanage somewhere on Skobelevsky Prospect. In 1942, when trolley buses started running again, a meeting of the 105th school was announced. I went, got out of the trolley bus on Batenina Street, and was ready to cross the road. Suddenly there was a hiss, a noise, a crash, as a bomb hit the corner of the school building. One teacher died and many people were injured by falling bricks. A police station was nearby. The district was cordoned off. I went back home. The first winter was terrible. Now I am surprised by only one thing: how did I endure it? And did it really happen? When you are walking down the street, and someone falls in front of you, you try to bring him round carefully and think that you must not fall down too, because if you fall, you will never get up. I saw dozens of sleighs carrying corpses; I had to step over dead bodies lying across my path when there were snowdrifts on the right and left. I also saw piles of corpses on the quay of the river Karpovka. So what did we worry about? We didn’t think that life was intolerable. During wartime everything is taken as it comes, both hunger and hard work. We knew that we had to endure. No one even thought the Germans might enter Leningrad! Our spirits were high. We were preparing for the New Year of 1942. My son brought a Christmas tree from the forest. My husband had been working in the factory “Krasniy Vyborzhets”. Trolley buses were not running at that time, and he had to walk more than 10 km on foot. Once I found my husband collapsed in the porch. My son and I dragged him into the kitchen. “Thank God, I’m home. I thought I’d got lost on the road” he said. Since that time I did not let him go to work. He took to his bed and got a dependency card, with the help of which we could get no more than 125 g. of bread. My husband died on 27 February 1942. Partisans on holiday were sent presents. Military units shared their food with us. There was a Christmas tree for children in the Gorky theatre. Children were fed at a dinner consisting of three dishes. The play “Home of the Gentry” was shown, but we didn’t watch it to the end. A bomb fell nearby, and everyone was sent to an air raid shelter and then home. An actress, who was playing Liza’s role, was wearing a squirrel fur, and her partner was in an overcoat. The audience warmed the theatre with their breath. I also had to watch the opera “Eugene Onegin”. It was played in the State People’s House in the Petrogradskaya district. The audience were in half-length coats, quilted jackets, and felt boots. Some cinemas were working, but it was hard to get a ticket. Olga Bergholz and Vera Inber were speaking on the radio, Preobrazhenskaya and Shulzhenko were singing. I even attended the performance of Dmitri Shostakovich’s Symphony No. 7 on 9 August 1942. I had the opportunity to send my children to an orphanage for meals after my husband’s death. I had been working there as a night nurse, as well as working as a teacher. My cousin Fedor Gartman lived with his family on Sytninskaya Street. He died in December 1941 and was taken out to the street. Heaven knows where he was buried. In April we discovered, that his wife and 12-year old daughter had also died. In September my 10-year old daughter’s ration cards for the second ten days of the month (from the 10th to 20th of the month) were stolen. Our school gave us 1 kg. of millet to help. We added it to a soup made with a swan’s foot. It was already 1942. Our administration were rescuing children and sending them to the mainland. There was a hospital there where children were properly fed. Tanya was sent to this hospital. Later my 14-year old son lived there for 2 weeks. It saved their lives. However, my mother died at the age of 82. In summer of 1942 the houses in Ozerky were bombed. Wooden ones were made into firewood. People were evacuated or relocated to undamaged houses in the city. But we stayed in our old wooden house and were very content with it. Our house was a place of communication between lost friends and relatives. Many people found each other with our help. My husband’s friend Vladimir Konokotin, a sapper, was injured during the Synyavinskiy Heights Battle and was sent to a hospital on Poklonnaya Hill. After his recovery he came and left us his details, because his house was destroyed, and he didn’t know where his wife and his daughter were. She wrote to us, and they met again after the war. I clearly remember January 1943, when the siege was breached. I was so happy! The blackout remained, and there was no gun salute, but we felt that a great victory was near at hand. The executive committee of Leningrad City Council decided to mobilize pupils of the 4th grade to do agricultural work from 4 June. Our school worked on the state farm “Bugry”. I took my daughter with me. She was eleven, and she wasn’t liable for mobilization, but she could get a work ration card. Later on pupils got their employment record books. My son stayed at home with his granny who was dying. She had asthma and hydropsy. The weather was awfully cold and rainy. Children didn’t get out of their quilted jackets. I tried to organize not only my work, but also times for rest. I took part in some amateur talent groups. Once I noticed that the boys had mysteriously disappeared after dinner. I found them 2-3 km away from our camp where there was a plane lying in the bushes. There were no people in it, either dead or alive. The boys said there were bombs in the plane. I sent them to the police station on Poklonnaya Hill to ask for help. Two days later I came to see “our plane”, but it had already been removed. For my work in “Bugry” I got a Lenispolkom’s charter and then the medal «For the Defence of Leningrad». Our school was well prepared for the next school year: plumbing and sewerage were functioning, and classrooms were heated. The war was still continuing. A bomb hit the 105th school again. But the city was gradually gaining strength. There was a pipeline and an electric cable laid on the bottom of Lake Ladoga. On 27 January 1944 a gun salute thundered. 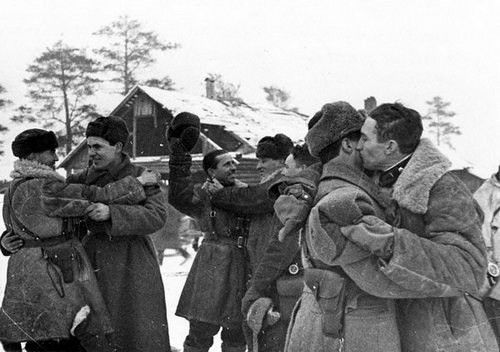 The Siege of Leningrad had ended and the front was now 100 km from us.